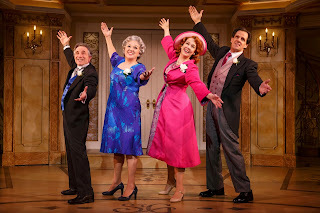 This musical about a wedding going dreadfully haywire is featherweight to be sure, but decked out with an impressive cast of Broadway pros, and directed with great style by David Hyde Pierce (in his Broadway directorial debut), it’s really quite entertaining. As Rebecca Steinberg (Sierra Boggess) and Brian Howard (David Burtka) get ready to tie the knot on their wedding day (on Anna Louizos’ classy two-tier hotel set), it’s clear that neither of their families is entirely keen on the prospect. 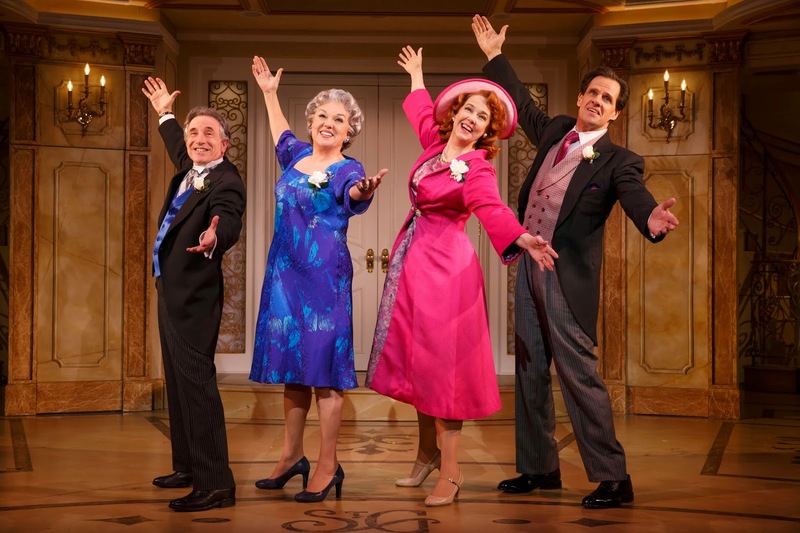 The bride’s parents (Tyne Daly and Chip Zien) think Rebecca’s former beau, Marty Kaufman (Josh Grisetti) would have been the better bet, as they sing to him in the number that gives the show its title. The groom’s alcoholic mother (Harriet Harris) has her own issues about losing her beloved son. And it’s taken a stint in therapy for his materialistic father (Michael X. Martin) even to begin to bond with him. Cultural differences between the Jewish Steinbergs and the Catholic Howards complicate matters further. Rebecca’s overweight sister Jenny (Lisa Howard) must endure her mother’s ongoing criticism about her appearance but tries to hold it together for her sister’s sake. Best man Greg (Nick Spangler) and bridesmaid Annie (Montego Glover) are on hand to help when things get out of hand…as you know they will do. Overseeing the farcical complications is effete wedding planner Albert (Edward Hibbert). 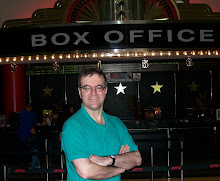 Rounding out the top-flight cast are Adam Heller and Anne L. Nathan as Rebecca’s Uncle Morty and Aunt Sheila, and they also double as the hotel staff. There are some genuinely surprising twists and turns in the plot which would spoil your pleasure to reveal, but as the intermission-less evening proceeds, the show morphs from pleasantly amusing to out and out funny. And each of the principals gets their musical moment in the spotlight. Glover and Spangler’s over-the-top wedding song to the bride and groom, to name one, is especially droll. Daly, Harris, and Hibbert score highest on the laugh meter with masterly comic timing and peerless line delivery. The script focuses on Jenny, though, and Howard really delivers, getting the star bow at show’s end, too. The production team is as top-drawer as the cast: William Ivey Long (Costume Design), Ken Billington (Lighting Design), and Nevin Steinberg (Sound Design). It’s easy to dismiss the show as “mere” sitcom material, but in truth, the show is constructed with consummate skill on every level, and cannily played by a cast that strikes just the right tone. We’ve seen our share of wedding comedies, but this is one with a decidedly different spin. It’s a pleasure to have a true musical comedy on Broadway again, emphasis on comedy. The audience at my performance clearly enjoyed itself, and I suspect, if you give yourself up to it, you will, too.